Here we go again – another artisan-style caramel product made with high falootin’, responsibly-cultivated ingredients. You’re probably thinking, “Wake me up when this review is over!”, right? Sounds likes a good idea. While you go ahead and take a snooze, I’ll just pop a few more of these squishy-delish, dairy delicacies in my mouth. If given the choice between eight perfectly blissful, uninterrupted hours of sleep or a Happy Goat Caramel graze-for-all, I think it’s pretty obvious which option I’d choose. Sure, I’m a sucker for sweets in their various incarnations, but in light of the sheer volume of confections currently in the marketplace, a product truly has to have that certain je ne sais quoi for me to become a repeat consumer. Happy Goat fits the bill, but not because I’m easily swayed by hipster-approved ingredients. As nice as certified organic, ethically-produced edibles are, the proof is in the actual pudding, which in this case I’d be more than happy to slather directly on my tongue in copious amounts. Each individual, cellophane-wrapped, pliable to the touch piece possesses an amber radiance punctuated with flecks of Madagascar bourbon vanilla bean. Homemade in appearance, the small-batch caramel treasure, upon being unwrapped, tastes just as good as it looks thanks to a hormone and antibiotic-free goat milk caramel base bolstered with goat milk butter, corn syrup, and organic sugar. The gingerbread-like warmth of this particular variety is achieved through the addition of a harmonious marriage of cloves, Ceylon cinnamon, ginger and allspice. It’s worth noting that goat’s milk is naturally lower in fat than cow’s milk, so adding it to a caramel recipe will automatically yield a final product that, while still delicious, will seem far less “buttery” than other artisan-style caramels. This doesn’t render it any less enjoyable than bovine versions, however. It’s simply just a different type of adult caramel – one that both intrepid foodies and lactose-intolerant individuals with an appreciation for sophisticated spice blends will happily embrace. If you make a conscious effort to consume foods that are free of genetically modified ingredients and agricultural chemicals, then you’ll be encouraged to learn that Happy Goat earns a natural foodie stamp of approval for their commitment to grazing their goat herd on 100% vegetarian, totally unadulterated, ruminant-friendly munchies such as alfalfa, clover and hay. Lazing about the rolling hills and dales of the countryside, the San Francisco based confectioner’s bearded brood is free to roam where they like â€“ and that general contentment translates into a fresh, light, and yes – truly tasty – goat milk-based product. 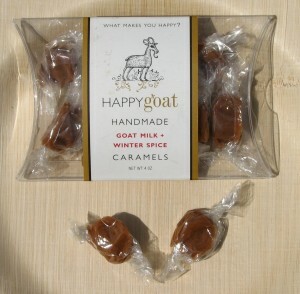 Easily chewable, a Happy Goat caramel will quickly dissolve in your teeth without posing a threat to dental work. If it didn’t clearly state on the package that goat’s milk was a main ingredient, you really wouldn’t be able to tell the difference â€“ it just tastes creamy-good, and with just 3.5 grams of fat per three piece 95 calorie serving, you’ll feel pretty cheerful about eating it, too. Boy, what a mouthful. Right out of the gate, a flood of divinely rich and surprisingly unsweetened dark chocolate will envelop your taste buds. The cacao works particularly well, offering a sobering balance to the innate sweetness of the corn syrup and organic sugar-enriched caramel base described above. As with its winter spice-laden compadre, this flavor variety rapidly dissolves into nothing more than a fond memory, with random salt and sugar crystals desperately clinging onto tooth enamel, ultimately in vain. Hmmmm… sea salt is listed as the final of seven total ingredients and while it continues to be the hip and trendy thing for candy companies to include in their sweets, there’s only the slightest suggestion of its presence. Frankly, this caramel is pretty darn delicious as-is, and even if it contained a heavier dash of salt (or, conversely, nothing more than a single grain of it), I’d still be more than enthusiastic about revisiting my package several times throughout the day. Sea salt junkies may experience a wee bit of a letdown, but that will soon pass once they realize that they’ve finally stumbled upon a worthwhile caramel that offers all of the pleasure with none of the hypertension pain. Whether you lean toward the spicy side of things or you like your sweets chocolatey delicious, the ten dollar investment for Happy Goat’s four ounce package of caramels is money well spent. I know â€“ that probably sounds kind of insane (helloooo, we’re in a recession!) but goats with a pep in their step clearly crank out some seriously sultry caramely goodness.